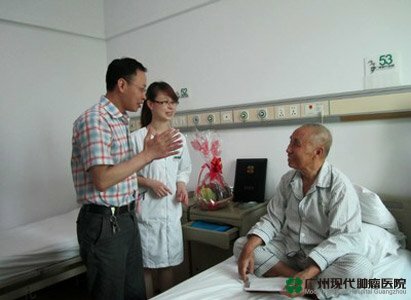 Wang Huaizhong, principle of Modern Cancer Hospital Guangzhou, visited patients in the wards. He had a long talk with patients and listened to their suggestions. It was the third time for Ruan Wenjing, a patient from Hanoi, Vietnam, to come to Modern Cancer Hospital Guangzhou. 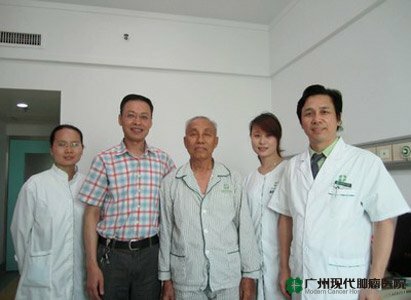 CT scans indicated that the tumor in his body shrank 80% through interventional therapy and biological immunotherapy, and in order to express his satisfaction with this curative effect, he sent a thanks letter to Director Wang before he go home. Director Wang responded personally to his letter and specially asked the doctors in Vietnam office to pay Mr. Ruan a visit and follow his condition. “Modern Cancer Hospital Guangzhou has got doctors of excellent medical skills, always-smiling nurses and pleasant environment. I no longer need to crowd in a ward with other two patients like some Vietnam hospitals do. It feels like home here as every doctor and nurse treat patients as their families. Principal Wang Huaizhong thanks Mr. Ruan for his advices of the hospital and wish Mr. Ruan gets well soon. Patient reads out reply letter from the hospital’s principal.